We’d love your help. Let us know what’s wrong with this preview of The Painted Maidens Trilogy by Terra Harmony. Seventeen-year-old Serena is the youngest member of a dying race. The increasing acidity of the ocean is destroying her home, slowly eating away at the once thriving underwater landscape. But since the night of Serena’s birth, it is an outside force that most threaten A Complete set of The Rising, The Betrayed, and The Taking, plus bonus short story 'How I Met Your Mother'. 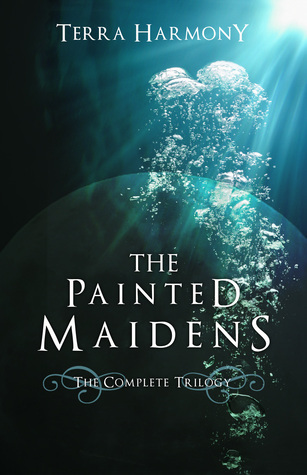 To ask other readers questions about The Painted Maidens Trilogy, please sign up. This story is set in a wonderful underwater world of a dying paradise. The stilted formal society of mermaids and mermen is slowing losing it’s population through adversity, tragedy and prejudice. Our main character, Serena, is an intelligent mermaid full of a need to learn and a dangerous sense of cu 3.5 stars. This was really good. I couldn't put the book down. The story grabbed me right away and I couldn't wait to see what was going to happen. This is like Twilight with mermaids! I recommend this for a really fun read! This is a really cool trilogy focusing on mermaids and werewolves and the rivalry between the two peoples, and it is really fun and interesting. I haven't really read many mermaid books and I'm usually not into werewolves, but the concept of the two together was just so interesting and unique that I really had to read this and I was not disappointed. I did feel that the ending of the final book came a bi I received a free copy from the publisher through NetGalley in exchange for an honest review. Terra is author of The Painted Maidens Trilogy ('The Rising', 'The Betrayed', and 'The Taking', the Akasha Series ('Water', 'Air', 'Fire', and 'Earth'), and 'The Kindred Curse Anthology'. Terra was born and raised in Colorado but has since lived in California, Texas, Utah, North Carolina and Virginia. Terra has served a 5 year enlistment in the Marine Corp, has earned her bachelor's and master's de Terra is author of The Painted Maidens Trilogy ('The Rising', 'The Betrayed', and 'The Taking', the Akasha Series ('Water', 'Air', 'Fire', and 'Earth'), and 'The Kindred Curse Anthology'.